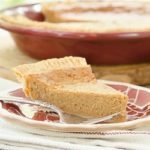 Baked Peanut Butter Pie is a delight for anyone who enjoys peanut butter. Its rich custard-like filling is smooth, decadent, and oh so good. Place pie crust in a 9-inch pie pan. Press crust against sides of pan. Fold edges under and press to shape edge as desired (I used a fork). Beat egg whites in a medium bowl until stiff peaks form. Beat egg yolks and brown sugar in a large bowl until mixture is light brown in color and thickened. Add peanut butter and corn syrup and beat to combine. Gradually beat in milk and vanilla. Fold in egg whites. Pour mixture into pie crust lined pan. Bake for 30 to 35 minutes, or until filling is set. Cool for 15 minutes or completely on a wire rack (pie can be served warm or at room temperature).